Many services are provided to a business by other than employees. These services may include janitorial support, legal services, air conditioner repairs, audits, and so forth. An independent contractor is one who performs a designated task or service for a company. The company has the right to control or direct only the result of the work done by an independent contractor. In contrast, an employee is defined as a person who works for a specific business and whose activities are directed by that business. The business controls the work that will be done and how it will be done. The distinction is very important, because the payroll tax and record keeping requirements differ for employees and independent contractors. As a general rule, amounts paid to independent contractors do not involve any “tax withholdings” by the payer. However, the payer may need to report the amount paid to the Internal Revenue Service (IRS) on a Form 1099, with a copy to the independent contractor. But, the obligation for paying taxes rests with the independent contractor. The employer’s handling of payroll to employees is another matter entirely. Begin by considering the specifics of a paycheck. Paychecks are usually reduced by a variety of taxes, possibly including federal income tax, state income tax, social security taxes, and Medicare/Medicaid. Additional reductions can occur for insurance, retirement savings, charitable contributions, special health and child care deferrals, and other similar items. Employers may also pay costs related to social security, Medicare/Medicaid, unemployment taxes, workers compensation insurance, matching contributions to retirement programs, and other items. The total earnings of an employee is the gross pay. For hourly employees, it is the number of hours worked multiplied by the hourly rate. For salaried employees, it is the flat amount for the period, such as $3,000 per month. Gross pay might be increased for both hourly and salaried employees based on applicable overtime rules. Employers are well advised to monitor statutes relating to overtime; by law, certain employees must be paid for overtime. Gross earnings less all applicable deductions is the net pay. Income taxes are required by federal, state (when applicable), and city (when applicable) governments to be withheld and periodically remitted by the employer to the taxing authority. In essence, employers becomes an agent of the government, serving to collect amounts for the government. Withheld amounts that have yet to be remitted to the government are carried as a current liability on the employer’s books (recall the earlier mention of amounts collected for third parties). The level of withholdings is based on the employee’s income, the frequency of pay, marital status, and the number of withholding allowances claimed (based on the number of dependents). Employees claim withholding allowances by filing a form W-4 with their employer. Social Security/Medicare Taxes are also known as FICA. FICA stands for Federal Insurance Contributions Act. This Act establishes a tax that transfers money from workers to aged retirees (and certain other persons who are in the unfortunate position of not being able to fully provide for themselves due to disability, loss of a parent, or other serious problem). The social purpose of the tax is to provide a modest income stream to the beneficiaries. This component is the social security tax. Another component of the Act is the Medicare/Medicaid tax, which provides support for health care costs incurred by retirees (and designated others). The social security tax is presently a designated percentage of income, up to a certain maximum level of annual income per employee. For illustrative purposes, assume a 6.5% social security tax, on an annual income of $150,000. In the following paycheck stub, note that I. M. Fictitious paid $195 in social security tax for the month (6.5% X $3,000). Since Fictitious has not yet exceeded $150,000 in gross income for the year-to-date, the annual maximum has not been reached. If Fictitious exceeds the annual limit, the tax would cease to be withheld for the remainder of the calendar year. The employee’s amount must be matched by the employer. Thus, the burden associated with this tax is actually twice what is apparent to most employees. The Medicare/Medicaid tax is also a designated percentage of income. Unlike the social security tax, there is no annual maximum. This tax is levied on every dollar of gross income, without regard to an employee’s total earnings. In the following illustration, the assumed rate is 1.5% (1.5% X $3,000 = $45). This is another tax the employer must match dollar-for-dollar. Other Employee Deductions can occur for employee cost sharing in health care insurance programs, employee contributions to various retirement or other savings plans, charitable contributions, contributions to tax-advantaged health and child care savings programs, and so forth. In each case, the employer is acting to collect amounts from the employee, with a resulting fiduciary duty to turn the monies over to another entity. A representative paycheck and the attached stub follows. Examine the check and notice that I. M. Fictitious earned $3,000 during the month but “took home” only $1,834. The journal entry to record I.M. Fictitious’s pay would be as follows. 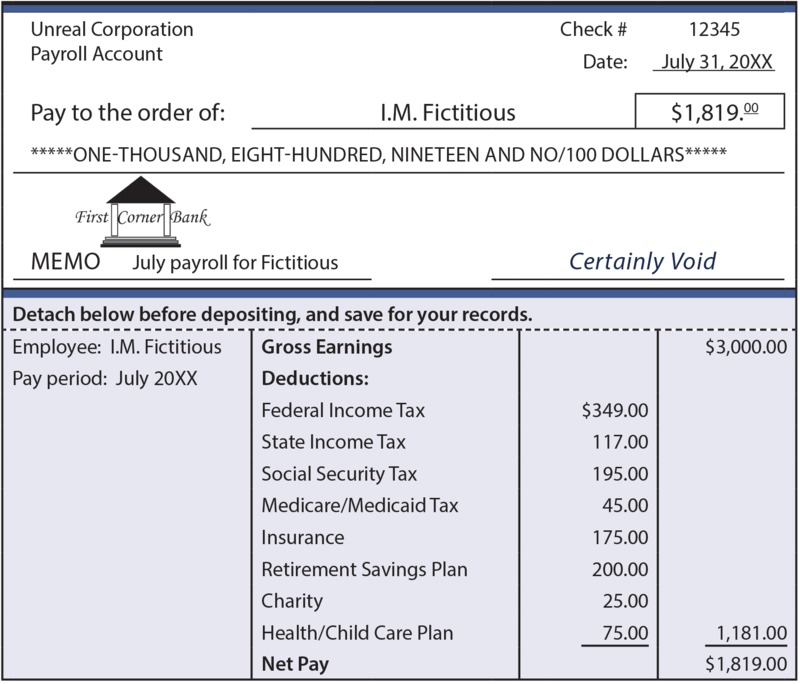 Carefully match the amounts in the journal entry to the amounts on the paycheck stub. Although not illustrated, as the company remits the withheld amounts to the appropriate entities (i.e., taxes to the government, retirement contributions to an investment trust, etc. ), it would debit the related payable and credit Cash. Recall that the amount of social security and Medicare/Medicaid tax must be matched by employers. In addition, the employer must pay federal and state unemployment taxes. These taxes are levied to provide funds that are paid to workers who are actively seeking but unable to find regular employment. The bulk of unemployment tax is usually levied at the state level since most states choose to administer their own unemployment programs (which is encouraged by the federal government via a system of credits to the federal tax rate). The specific rates will depend on the particular state of employment and each individual employer’s employment history. Employers who rarely lay off or fire employees enjoy a favorable rate, but those who do not maintain a stable labor pool will find their rates adjusted to a higher level. Like social security, the unemployment tax stops each year once a certain maximum income level is reached. In this text, assume the federal rate is one-half of one percent (0.5%), and the state rate is three percent (3%), on a maximum income of $10,000 per employee. Thus, assume the federal unemployment tax (FUTA) is capped at $50 per employee and the state unemployment tax (SUTA) is capped at $300. 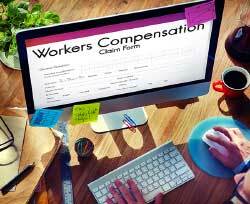 Many employers will carry workers compensation insurance. The rules for this type of insurance vary from state to state. Generally, this type of insurance provides for payments to workers who sustain on-the-job injuries and shields the employer from additional claims. But, for companies that do not carry such insurance, the employer may have an unlimited exposure to claims related to work place injuries. The cost of this insurance can be very high for risky work, like construction. Employers may provide health care insurance and retirement plan contributions for employees. These amounts can be substantial, perhaps even exceeding the amounts employees contribute on their own behalf. Current law requires employers meeting certain thresholds to provide healthcare insurance to employees or face substantial penalties. Obviously, the employer’s cost of an employee goes well beyond the amount reported on the paycheck. For many companies, the total cost of an employee can be 125% to 150% of the gross earnings. Of course, these added costs should be entered in the accounting records. Shortly after the conclusion of a calendar year, an employer must review its employee records and prepare a summary wage and tax statement (commonly called a W-2). This information is furnished to each employee and the government. It helps employees accurately prepare their own annual federal and state income tax returns and allows the government to verify amounts reported by those individual taxpayers. Accuracy is vital in payroll accounting. Oftentimes, a business may hire an outside firm that specializes in payroll management and accounting. The outside firm manages the payroll, recordkeeping, government compliance, timely processing of tax deposits, and the like. When a business manages its own payroll, very accurate data must be maintained. Most firms will set up a separate payroll journal or database that tracks information about each employee, as well as in the aggregate. In addition, it is quite common to open a separate payroll bank account into which the gross pay is transferred and from which paychecks and tax payments are disbursed. This system provides an added control to make sure that employee funds are properly maintained, processed, and reconciled. It is very important to know that the employer’s obligation to protect withheld taxes and make certain they are timely remitted to the government is taken very seriously. Employers who fail to do so are subject to harsh penalties for the obvious reason that the funds do not belong to the employer. Likewise, employees who participate in, or are aware of misapplication of such funds can expect serious legal repercussions. The government has made it very simple for employers to remit withheld amounts, as most commercial banks are approved to accept such amounts from employers. Online systems also allow easy funds transfer. The frequency of the required remittance is dependent upon the size of the employer and the total payroll. What is the significance of the distinction between an employee and an independent contractor? 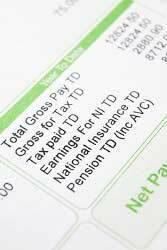 Distinguish between gross pay and net pay. Identify the nature of social security and Medicare taxes, and understand the calculations related to the rate and base. How do income taxes and other deductions enter into the calculation of net pay? Be able to record journal entries for payroll and withholdings. What is a W-2, and what is a W-4? In addition to an employee’s salary or wages, what other costs must an employer incur related to payroll? Be able to record the payroll taxes levied on the employer. Describe the importance of maintaining accurate payroll records.